Movement of prey on hydrologically pulsed, spatially heterogeneous wetlands can result in transient, high prey concentrations, when changes in landscape features such as connectivity between flooded areas alternately facilitate and impede prey movement. Predators track and exploit these concentrations, depleting them as they arise. We sought to describe how prey pulses of fish rapidly form and persist on wetland landscapes, while enduring constant consumption by wading birds, without being fully depleted. Specifically, we questioned how is the predator–prey relationship mediated by interactions between animal movement and dynamic landscape connectivity? Two models were developed of the predator–prey-landscape system with qualitatively different representations of space, to identify and quantify prey pulsing dynamics that were robust across modeled assumptions. The first included a homogeneous landscape described by simple geometry, and implicit fish movement as wetland volume contracts. The second modeled transverse movement across a heterogeneous landscape, with isolated drying patches. Both models produced rapid fish prey concentrations as the wetland dried to shallow water depths. These conditions are critical for making prey available to wading birds. Fish were also rapidly depleted by birds, representing daily caloric intake supporting birds. Model 1 provided average estimates across the modeled domain. Model 2 mapped locations of emerging prey hotspots on the landscape through time. Our models tracked predator, prey, and landscape dynamics in parallel, inducing systems dynamics from empirical observations. 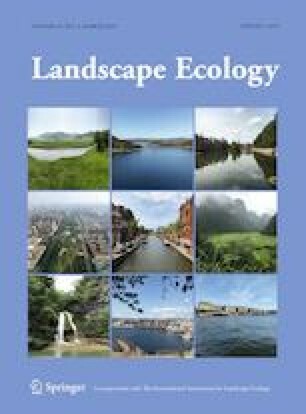 Explicit inclusion of dynamic wetland hydrologic connectivity, a key landscape mechanism, allowed for a comprehensive picture of links between landscape dynamics and the adapted predator–prey system. The online version of this article ( https://doi.org/10.1007/s10980-019-00784-0) contains supplementary material, which is available to authorized users. We thank the editors of The Auk for permission to reprint results from Kushlan (1976), and Gus Engman and four anonymous reviewers for their generous time and contributions. This work was supported by The USGS’s Greater Everglades Priority Ecosystem Science and the U.S. Fish and Wildlife Service. Any use of trade, firm, or product names is for descriptive purposes only and does not imply endorsement by the U.S. Government.